It’s just a jump to Mount Vernon. And then a step to St. Paul. Stop at 817, and take the steps but don’t fall! See it’s those crazy shows that really drive you insa-ay-ay-ay-ane! Let’s go to Spotlighters again! Let’s go to Spotlighters again! Richard O’Brien’s The Rocky Horror Show in its full fabulous glory is time warping its way through The Audrey Herman Spotlighters Theatre in time for Halloween this 2014. Directed by Greg Bell with Musical Direction by Michael Tan, this cult classic has everything you loved about the movie in a live stage show and then some. There’s even a late-night double feature on Saturdays so if you miss it at 8pm you can catch it at 11pm! When one thinks of The Rocky Horror Show many things come to mind all at once, but above all the insanely fabulous costumes that earmarked it as a fashion trend gone wonky. Costume Designer Todd Douglass lives up to this standard with the outrageous outfits and makeup designs used throughout the production. The Phantoms are phantasmagorical with their skimpy yet threatening apparel while Riff-Raff, Magenta, and Columbia take on the striking biker approach with all the leather featured in their outfits. 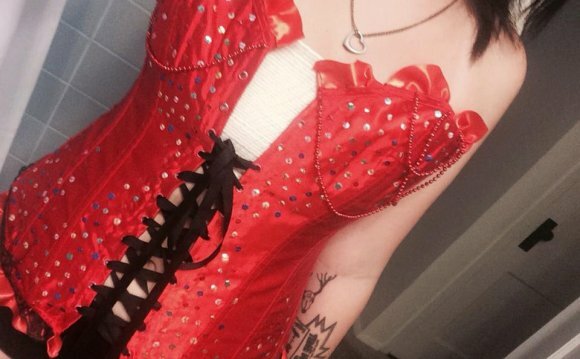 The corsets are to die for, especially the sparkling ones saved for Frank. Douglass outdoes himself with fishnet stockings, spike-pointed push-up bras and the sexiest heels a sweet transvestite could ever hope to lay eyes on. Musical Director Michael Tan, simultaneously the Keyboardist and pit conductor for the ‘Dead Band: The Stillborn Unicorns’ does a spectacular job of bringing all the iconic musical numbers to vibrant reanimated life. Tan puts a unique spin on a great deal of the orchestrations, turning “Eddie’s Teddy” into a hillbilly twang routine, “Touch-a Touch Me” into an 80’s pop opera and many other sneaky little surprises that will really throw the audience for a whirl. Balancing the volume as best as he is able, the look of utter insanity is completed with manacles that shackle the pit band to the wall. Choreographer Jillian Locklear Bauersfeld brings a hybrid of cult-classic routines that the audiences knows and loves so well and intriguing new zombie-vamp inspired dance moves to the musical numbers of the production. Bauersfeld’s work is primarily witnessed among the Phantom ensemble, their jarring motions almost like an undead hoard striking forth on the fresh flesh of the living. Numbers like “Time Warp” and “Hot Patootie” feature a fair bit of upright shake, rattle, and rolling while earlier numbers throughout feature the frightening trance-like crawling where the Phantom core moves almost as a singular entity. It’s Director Greg Bell who owns the show. From the pre-show entertainment (RHS virgins beware!) right through the final rendition of “Time Warp” Bell’s presence is felt and heard throughout. If you’ve never experienced Rocky Horror the way it was meant to be experienced, Bell has a handle on that for you. Calling out all of the trick-lines and hilarious things that made the show a cult classic over the year, he truly becomes a master of ceremonies. Not to mention his directorial skills keeping the show on a steady, albeit absurd, course to science-fiction insanity. Enough good words cannot be found for the vision Bell stirs up on the Spotlighters stage, but it sure does look fun and fascinating!